We offer a variety of cutoff units for your cutting and parting needs. All with integrated encoder systems for part length accuracy. Our larger pipe and profile saws typically have AC motors for brushless operation. DC servo motors are used on our smaller profile and tubing cutters. 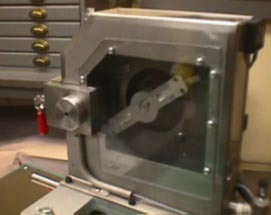 We also design and build many custom cutting devices for unique processing requirements. Please contact the factory for additional information. Model AB14S: Designed primarily for smaller pipe and custom profiles, the Model AB14S can handle pipe up to 4" in diameter and custom shapes up to 2" high x 6" wide. It's capable of 20 cuts/minute at a maximum line speed of 35 ft/minute. Model AB18D: Designed specifically for larger pipe, the Model AB18D can handle up to 6" pipe. It's capable of 10 cuts/minute at a maximum line speed of 25 ft/minute. It has a full 24" of table travel, and an air over oil system for smooth actuation of the cutting and retraction stroke. 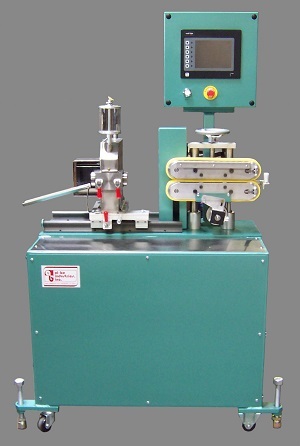 Model 212SC The Model 212SC, our smallest servo cutter is perfect for use with medical tubing lines or small profile lines. It's microprocessor based system is highly accurate and provides excellent cut length control. Capable of 400 cuts/minute in on-demand mode, and 1800 cuts/minute in fly knife mode. 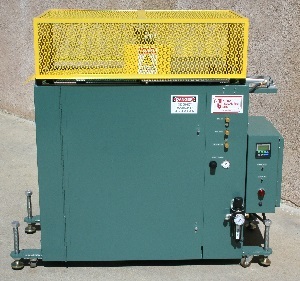 Model 212SPC 0-2" capacity opening, 2" wide belts, 15" contact length puller. Top and bottom belts manually adjusted via single handwheel control. Servo motor and processor for precise puller speed and length count. Servo motor and processor for cutting application coupled to puller frame with hardened slides for ease of cutter movement. No gearboxes or clutches. Blade holder fixtured directly on servo motor shaft. No moving parts to wear or replace. Ideal for small tubing and profile. Digital touch screen micro-processor for input of puller speed and extrudate cut length. 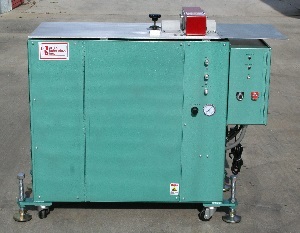 Model 214SC The Model 214SC servo cutter has a larger part cutting capacity than the Model 212SC. Also with a microprocessor based system, it too is highly accurate and provides excellent cut length control. 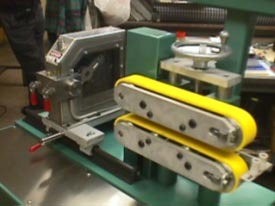 Capable of 400 cuts/minute in on-demand mode, and 1800 cuts/minute in fly knife mode.